I have tried other styles of Ring Sizers, but was always disappointed because they didn't work well at all. I'm so glad to finally find some that are easy to use and work very well. Other ring sizers tended to come off and get lost or to be uncomfortable. These stay put and are comfortable, plus they are easily removed and reused. Great problem solvers. I have tried many ring sizers and this is the one that works best for me. This is my second time purchasing it and I got an extra one for a gift. I absolutely love these, so I am re-ordering so I don't have to take off one ring to exchange to another, as I have MANY rings. These work better than any I've tried, and they fit most rings except ones with a really wide band. They are great. really do work! hard to find so I was very glad to find these in the catalog. very quick delivery! They go onto the ring so easily and are not too thick to be uncomfortable. I have tried other products like this but have never found a good one until now. I have a wedding ring, engagement ring and an anniversary band that always slipped around my finger. After putting one spiral on all the rings together they now stay in place exactly as I wanted. So glad you had this product!! Looked everywhere for it!! Have only had them a short time, but they seem to work. With the spiral, they stay on the ring, and so far do not fall off the way the ones with the slit. THese sizers worked instantly and are comfy to use! These allowed my mother to wear the new ring I bought for her until I could get it sized at a jewelry store. If my rings are too large I can use the ring guards that come in a set of four and do what it's designed to do. Keep a ring that's a bit too large fit to size. Works great on all types of rings. Best for those that are not rounded in back. My ring fits secure on my finger using this product & will not fall off. I have lost a considerable amount of weight and am continuing to do so. I have been unable to wear my wedding rings because they are too big now. I don't want to have them resized until I am done losing weight. In the interim, I have been able to wear them with the ring sizers. They are perfect and just what I was looking for. This ring guards were easy to put on the rings, are comfortable and do not interfere with the wearing. They do make the ring much smaller and are not adjustable so good only if the rings are very large on your fingers. If not, this is not the product to use - you would need adjustable guards. Great because I can buy any costume ring no matter what size it is, It fits! I love these, they are spiral, and stay put. I recommend them to anyone needing to resize. Initially the spiral sizes are somewhat difficult to put on but once on, they are excellent they don'move when washing hands as the previous sizers I used. Lost some weight not enough to have the rings sized so could not wear them. Now I can wear them again. Save yourself a trip to the jewelers. This product is fantastic to keep a ring from spinning. If you buy a ring for your middle finger and decide you would occasionaly like to wear it on your ring finger --- this does the trick. This stays on the ring and does not come off unkess you take it off. It is a clever, unique solution for any ring. Love...it! Product works well in keeping my rings together. I like these ring sizers better than any I have bought before. They are much easier to get on the rings than the straight kind of sizers. I will probably be ordering more of them later. Thanks for improving on these sizers. Finally a ring sizer that actually stays ON! Easy to get on the ring band, and it stays put. Not like the other solid plastic ones with the opening across the whole piece.... that easily comes off when you don't want it to. No need to alter your rings ever again. This spectacular spiral ring sizer saves you money, time and extra gold or silver. They have perfected this concept. 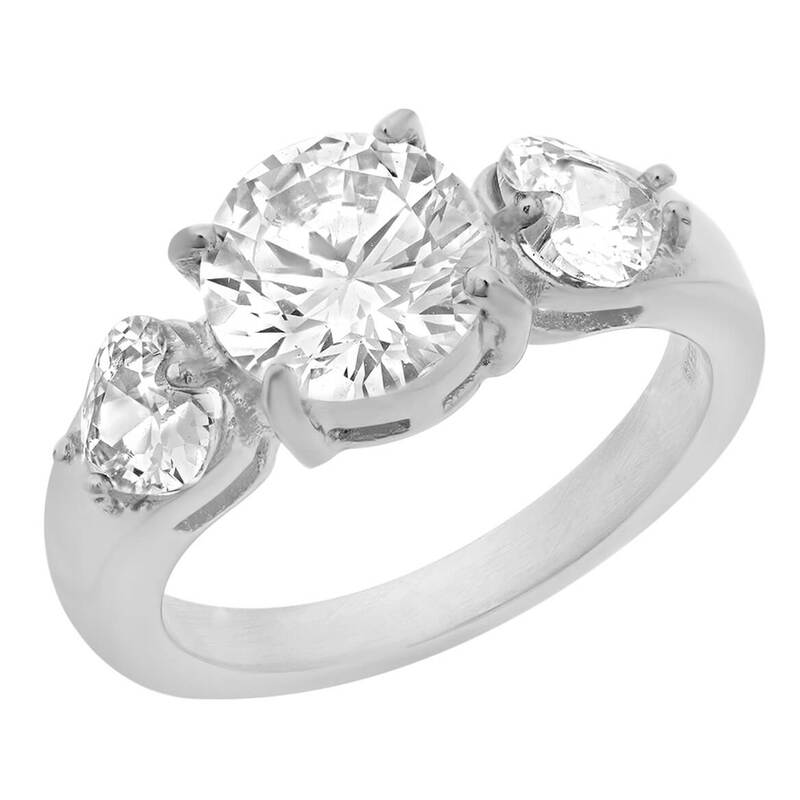 It comfortable and adjusts your ring in seconds so that it fits. It actually adjusted a size 9 ring to a size 7 ring in seconds. It adjusts to your finger. You don't even know you have it on. It wraps around the ring. It's a safe, clever, unique creation. Love it! These little things are easy to use and do the job. Use daily and some for special occasions. Used these for my boyfriends ring and he put it on the ring and has not had any issues with the ring twirling around his finger.. These work better than any other product! I have tried many other products, but these are the ones that work without fail! Just slip onto ring or several rings together, and they never slip off! Bought these for my mom's rings, which she had to have adjustments put into due to her boney knuckles, arthritic changes, etc...but then the rings would spin, Problem solved!!!!!!!!!!! My daughter couldn't wear her diamond ring after her pregnancy on the fourth finger, so we slipped one of these on it, and now she can wear it on the third finger and it is secure. She just wants to wear it, didn't matter where. Thanks, great accessory. 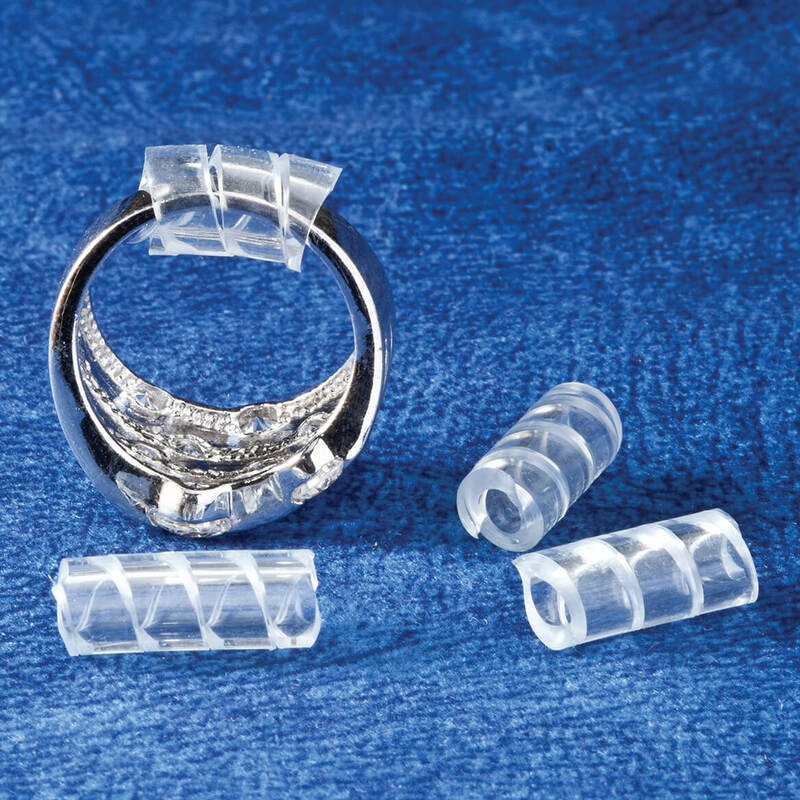 These ring sizers work the best of any I've tried. They are very easy to put on your ring and stay on until you want to remove them. They are also very comfortable. I wanted to wear my Dad's wedding ring without having it sized. I tried several different methods to size it with limited success. The spiral cut on this sizer is ingenious. The straight cut sizer that I tried fell off & therefore the ring did also. The ring is not permanently changed & I can wear it without worrying about losing it. Finally, I found something that worked without having to have my ring sized. The spiral cut is ingenious. I used a sizer before that was just a straight cut. It would come off & then the ring would come off. I lost it short term twice. Easy to apply and perfect for reducing the size of a ring. When Rings are to large, or they flip around on finger. This is a temporary fix, so you don't to have rings sized. It works better then a string. My little lady just turned 93 and she has problem making some of her rings fit. This item really took care of it. I do wear it every day but take off on the nights I work as an STNA. Does move around on the band of the ring and can scratch. I am getting use to it. These work so much better than the solid piece of plastic. They can be cut to provide the right fit for each ring. I bought these because I have an antique ring that is a little too large but is too delicate to have resized. Didn't want to resort to one of those metal resizersbecause they might damage the ring. So these were a brillent idea solution to me. Received them promptly, put them on the ring but now can't get the ring on my finger, any finger. So I had to remove them and where the ring as is, it won't fall off but spins around my finger. This worked very well. Wouldn't mind seeing in a thinner plastic as well. It was not quite what I expected. As I said previously the rings still twist. I have tried other ways to make loose rings fit better and these really work well, as they are easy to get on the ring and can be switched to other rings, although it is better to buy several and keep one on each loose-fitting ring. I couldn't get them to go around rings that had wide bands but all others fit well. These work so much better than ones I had previously ordered here, which had no flexibility and kept coming off the ring. The way this one is spiraled make it work. When it arrived, I put it on my ring and forgot about it, even tho I could feel it was there. I had hurt the tendons in 2 of my fingers half after falling on the hand and slamming it on furniture a year ago and found out they will never be the same. It increased my ring size on this hand by 2 sizes; the cost or resizes rings my gosh is like $35-40 a ring! I have my share of rings I like to wear and they are loose on my other hand. These took care of the looseness at a fraction of the cost of redoing the rings. You have to work at getting them on but it is worth it for the minor cost of them. This product was not all I thought it would be. It's hard to wrap evenly around the ring. These work on very narrow rings only and only if you need to take up a lot of space. when we gain it back..our rings still fit. Can only use them once...Son't lay flat the second wearing. This is no different than the plastic tubing you can buy at your local pet store for a fish tank. Do yourself a favor and buy a pack of tubing for less than this price and shipping, cut a piece off, and slice it down the middle. Works the same and you'll have enough tubing to keep yourself in ring sizers for a lifetime. I used the ring guards to keep my rings on, as the are to big for my fingers. I liked the ring sizes, as my rings stayed on, but the sizes would not stay in place on the ring. I am always turning the sizes to the palm side of my fingers. After losing some weight, now my rings are quite loose. Bought this to help, hoping not to go to a jewelers for resizing. It is a little bulkier than i thought it would be, and slides around some, but it does work. I have small fingers and the spiral rings go almost completely around my finger. I tried cutting them, but did not work very well. This didn't help keep my mom's rings from spinning around on her finger. It was easy to put on though and to cut off when my mom's fingers swelled from an injury. rubs on side of other rings,still makes ring turn. I would not suggest this item to anyone to purchase. It does not fit around wide band rings and comes off very easily. It is not worth the money I spent to purchase it. Do not waste your money on these. Very uncomfortable. Unattractive when wearing them. Nothing good about them. I wasted my money by buying them. It constantly slips to the side, thus becoming ineffective in reducing the ring size. I do not recommend this product. I wear a size 6 1/2 ring. The buying options for my ring were 6 and 7. O got the 7. Using this product the ring fits around my finger better, but the ring still spins freely around my finger. sideways so the stones hide between my fingers. The sizers just slide also instead of holding the ring still. I am between sizes on my rings and need to make some a bit smaller. I tried them before and found them to work well. I need to put them on some rings that are a little too large and turn on my hand. These will stop that twisting. Not only can they be used on rings, but also on cell phone cords when charging. Have several rings that at times are too big and slip around. Not really wanting to pay the expense of having them down sized beings are costume. Rings fit differently and even thought these spirals don't always feel comfortable, they help. I almost lost my ring as it is too loose. I'm hoping this sizer will help. Ring slips slightly around finger. I have lost weight and several rings are to big. I think it will be the most secure way to size rings that I wear on different fingers. My rings are to big. The metal ones are not useful. looked like it would help fit the rings that are too big. my ring is too big. 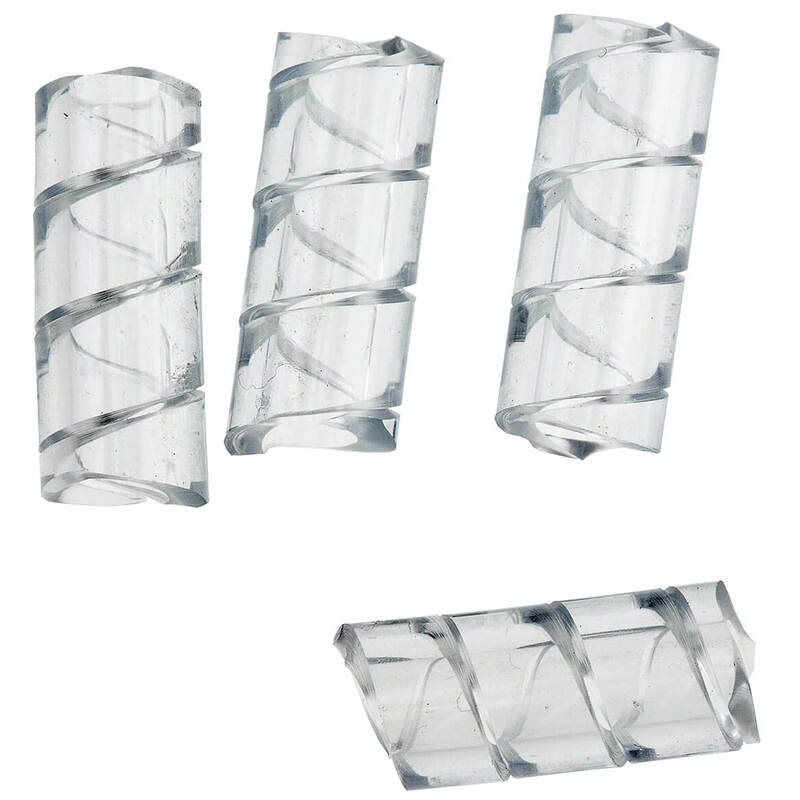 I choose the spiral ring sizers because I lost weigh and therefore my fingers also got smaller and I am afraid of losing my rings. have tried other styles that didn't work so will try this one. I have several rings that need to be sized. This may be a temporary fix until I can get them sized. Lost weight and rings are slipping. Loosing a little weight and my rings are all turning on my fingers. my ring keep turning and I want to see if this nhelps. Will these work on Class Rings? BEST ANSWER: I do not see any reason why not. I used one of these on my wedding ring set that the band width is a little over a quarter inch wide. I had to work a little to wind the spiral around it but after I sthe spiral started it wound itself around and keeps my rings on securely. It depends on the thickness of back of the ring where the sizer fits. IMHO, the sizers fit rings where the back is the width of a typical woman's ring. They might stretch to go around thicker bands -- I don't know. But once on, they stay put and are comfortable to wear. They didn't work well on any of my rings and I believe they will be too small to fit a class ring. I wouldn't purchase these again. I don't think so. I tried them on 3 different rings and they didn't work, ended up returning them. bought the rings for my mom. ring stays on but still spins. Put on one spira. sed to use more than 1 on 1 ring? Is there more than one size? BEST ANSWER: Thank you for your question. You can use 2 on 1 ring it. We hope this information will be of help to you. Have you got something that holds the ring set together? Do not want to get them permanently welded together, and they fit fine. Just want the diamonds all lined up. Saw something a while ago that was a C-shape that fit around the wedding & engagement rings to keep them straight. BEST ANSWER: Thank you for your question. Unfortunately we do not carry an item that will do that. We hope this information will be of help to you. When will the spiral ring sizes be available again? BEST ANSWER: Thank you for your question. They will be available after 3/29/2016. We hope this information will be of help to you.